Turn on your Rudolph mp3, pour yourself a low-fat cocoa and curl up beside the faux fireplace with your cellphone: the winter holidays have entered the 21st century and are playing out before our eyes on social media. HootSuite has gotten into the holiday spirit with a dedicated Holiday social media command center, gathering together all the treats Twitter and Facebook have to offer this December. Anyone in the retail industry knows what a valuable time of year this is, but also how hectic and even frustrating it can be for customers. Understanding the real-time sentiment of seasonal shoppers will give businesses insight on how their clients are feeling about stores, products and the shopping experience in general. More broadly, the command center will offer insight into how many people are tweeting about the holidays, and their sentiment about both the holidays and their shopping experiences. HootSuite, whose patented social media dashboard is now utilized by over five million global users, announced the creation of HootSuite command centers in October 2012 to help organizations get the most value from their social media management. The offering, soon available to Hootsuite Enterprise clients, will let companies, especially large enterprises, command and control all of their social activity by giving social media teams the ability to monitor, measure and react to all online activity in real-time. The command center was put on display during the American presidential election this fall. Journalists and members of the public watched the social media election story unfold on a command center that compared the mentions and likes of both candidates. The command center made it clear that Barack Obama’s victory in the polls was accompanied by a victory in social media influence. That same technology has now been put to use in a retail context. Which retailers and products are leading in the holiday polls? 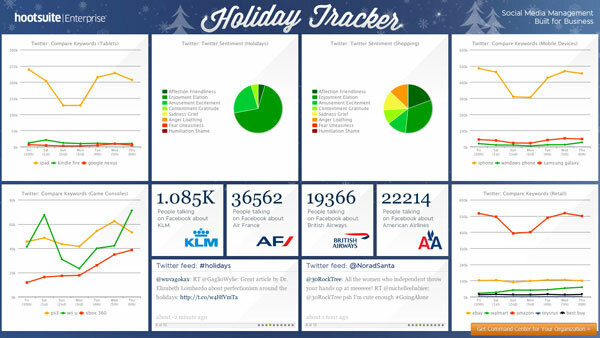 Get into the spirit by visiting HootSuite’s Holiday Tracker command center. This entry was posted on Friday, December 7th, 2012 at 8:26 am and is filed under Business News, National News, New Releases, Social Media, Software. You can follow any responses to this entry through the RSS 2.0 feed. You can leave a response, or trackback from your own site.